Before using Harmony Paint, you have to start the program. You can run the software on Mac OS X or Windows/Linux operating systems. 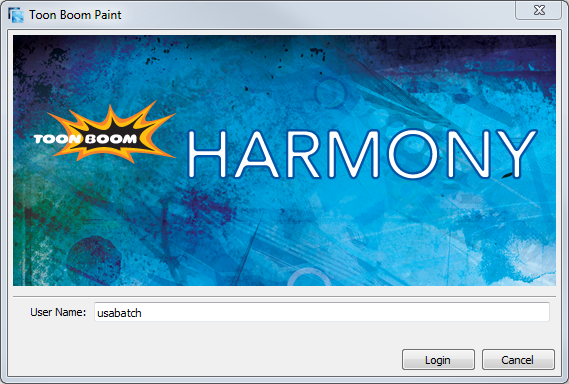 Harmony Paint opens, displaying the Login Screen. 2. Enter your Harmony user name to login to the Database. To work on Harmony Paint, you need to be connected to the database to have access to the scenes stored in the central database of Toon Boom Server. You cannot open offline scenes with Harmony Paint. 3. Click on Login. Harmony Paint Opens. Harmony user names are created via the Control Center. If you do not have a user name, contact your IT department. Refer to the Control Center and Server Guide to learn how to create Harmony user names.